An electric arc is a device in which an electric current (a flow of electrons) is caused to flow between two points separated by a gas. The two points are called electrodes. The one from which the current originates is the cathode. The electrode toward which electrons flow is the anode. The term electric arc refers both to the device itself as well as to the electric discharge that takes place within the device. Arcs can make use of high, atmospheric, or low pressures and can contain a variety of gases. They have wide uses as luminous lamps; as furnaces; for heating, cutting, and welding; and as tools for certain kinds of chemical analysis. Gases are normally poor conductors of electricity. The atoms or molecules of which they consist usually contain no free electrons needed for a current to flow. That condition can change, however. If sufficient energy is supplied to the gas, its atoms or molecules will break apart (ionize) into charged particles. If a spark is passed through a container of oxygen gas, for example, oxygen molecules ionize to form some positively charged oxygen ions and some negatively charged oxygen ions. These charged particles then make it possible for the gas to become conductive. to produce ionization at a given temperature and pressure. That energy is known as the gas's breakdown potential. 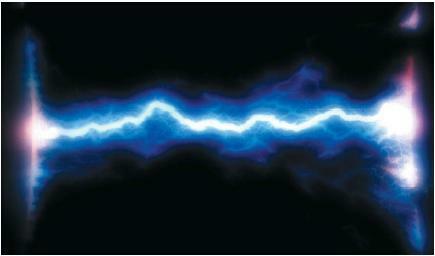 One example of an electric arc is a lightning bolt. In nature, two clouds can act as electrodes, or electric current may flow between a cloud and Earth's surface. In either case, current flows through the air, ionizing molecules of oxygen, nitrogen, and other gases in the atmosphere. The light and sound associated with lightning are evidence of an important change that occurs in the gas between electrodes. The flow of electric current heats the gas to high temperatures. The light associated with lightning is evidence of that change. The clap of thunder is another sign of the change—the heated air around the lightning bolt expands rapidly, producing a sound wave. The simplest electric arc consists of two electrodes made of a conducting material and situated a short distance from each other. Air is the gas used in this arc. This kind of electric arc was first studied by English physicist and chemist Humphry Davy (1778–1829) in 1808. Various types of electric arcs differ from each other in two respects: the pressure at which they operate and the materials of which they are made. Electric arcs can be enclosed in glass or plastic containers from which air has been pumped out (vacuum arcs) or to which air or some other gas has been added (high pressure arcs). The light produced by an arc depends both on the material from which the electrodes are made and on the gas that separates them. Some electrodes have no function other than to conduct an electric current into and out of the arc. Other electrodes are chosen because they tend to vaporize when the arc is used, changing the discharge that is produced. Various gases are chosen for use in electric arcs because they too affect the discharges produced. For instance, each chemical element produces its own characteristic color when ionized. Many types of arcs exist, each with its own applications. For example, arc welders are used for welding (where a metal is fused and added in a joint). In some cases, the arc's only function is to supply heat. In other cases, the metal from one electrode may actually be used in forming the weld. Plasma torches are used for cutting, spraying, and gas heating. Plasma is a term used for hot, ionized gases. Cutting a metal with a plasma torch may be done by means of an arc formed between the metal itself and an electrode from the torch. Electric arcs are often used as lamps because of the amount of light they produce. That light comes from hot, glowing electrodes (carbon arcs) and, sometimes, from heated gases (flame arcs). The carbon arc, in which two carbon rods serve as electrodes, was the first practical commercial lighting device. It remains one of the brightest sources of light and is still used in theater motion-picture projectors, large searchlights, and lighthouses. Flame arcs are used in color photography and in photochemical processes because they closely approximate natural sunshine. The carbon is saturated with chemicals that boil off easily. These chemicals become luminous when they evaporate and are heated by the arc. The color of flame arcs depends on the material of which the electrodes are made. For example, calcium arcs give off a red glow, while barium arcs give off a green glow. In some flame arcs, the radiation produced is outside the visible range. Mercury arcs at high pressure produce ultraviolet radiation. They also can produce visible light in a low pressure tube if the internal walls of the tube are coated with a fluorescent material known as a phosphor. The phosphor emits visible light when struck by ultraviolet radiation from the mercury. Arcs can also be used in radio valves, such as those used in the early days of radio, and as a source of ions in nuclear reactors and thermonuclear devices (devices for controlling the release of nuclear power). why gases at high pressure and high voltage does not conduct electricyity. For example in the case of gases does not conduc at the aforesaid condition? i am doing a project on electricity for school. for the project i want to build an electric arc. i already got an ok from my teacher to build one. i wanted to know if you knew simple instructions that can make an arc. they also have to be easy materials to get. i would be reallt greatfull if you could help me. I am doing project on Electricl arc and we have read some notes on net. but I am confused at what value of temperature, air will be ionised and how pressure will be more under electric ARC. Is there any relation with overheating of air and pressure. DOES AN ELECTRIC ARC DEPENDS ON ONLY PRESENCE OF AIR OR ANY MEDIUM ONLY CAN WE PRODUCE AN ARC BETWEEN TWO ELECTRODES WHERE AIR IS NOT PRESENT . I am doing project on electric arc and i nedd information about electric arc generation,type of electric arc & effect of electric arc on air. Does it mean that electric arc can be produced even in vacuum? Can the arc sustain for a long period? Does it's intensity increase or decrease? I am doing a project to prevent electric arc formation when dealing with voltage cables of around 20KV. Any ideas on how to prevent the arc? Is there any college level application for arc.